The brief for this police office, a sentinel posted on the outskirts of Vaals, splits into three elongated parallel blocks. Each has its own job to do and its own material: a zinc block of cells, a timber administration zone and an office block of reinforced concrete, a material also found on the various roofs of the complex. 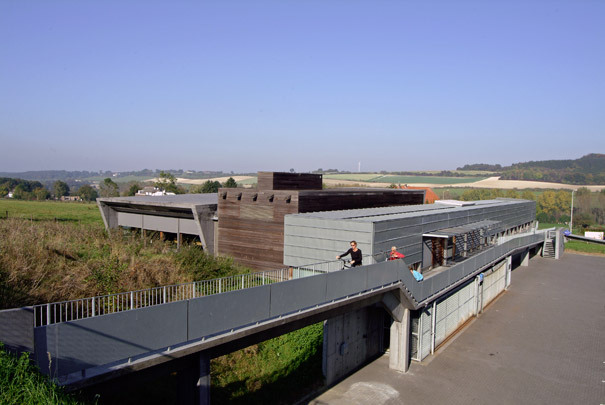 The whole is accessed by a pedestrian route bridging two levels in the immediate surroundings. By looking from the entrance in the centre of the zinc block along a sight line square to the trio of blocks, the building’s organization can be taken in at a glance.